There is a perfunctory element of getting the band together whenever any superhero team is started or restarted. With something like The Avengers or Justice League, it’s an easy step to gloss over. Readers (or even fans of the movies) understand the concept and key players, allowing creators to assemble their crew in a handful of pages for the sake of simplicity. That’s not the case with Exiles though. Not only has the concept been retired for a full decade, but its very premise means that almost every member of the team is new to readers. Thus the initial step of assembling the team becomes much more complicated, requiring ample exposition and reminders. 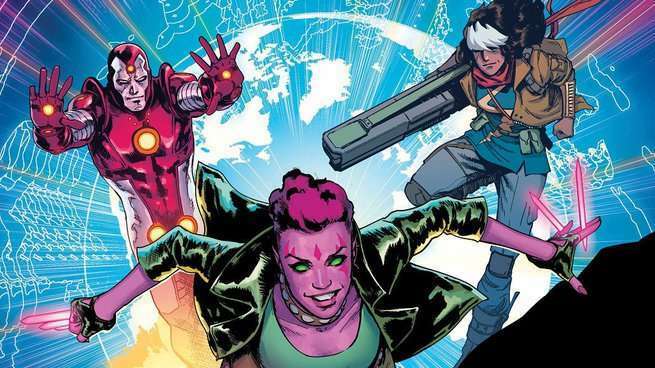 It’s this tough initial hurdle that makes even the awkward elements of Exiles #1 look impressive and provides reason to believe this could quickly become one of the very best series at Marvel Comics. Ahmed faces the daunting task of introducing three new characters, two of whom come from new alternate Earths, the concept of the Tallus, and a brand new threat in a tight 20-page package. This leads to several instances where word balloons pile up and dialogue collides with direct exposition. These are the exceptions of the issue though, coming at moments when it’s better to explain the mechanics of an old series and move forward than allow for confusion. Yet like Mary Poppins, Ahmed understands that a spoonful of sugar helps that medicine go down. For any flaws in a few pages of scripting, there’s a lot of life in the majority of this comic. His rendition of Blink is vibrant, and her one-liners make even the tedium of The Unseen more bearable. Compared to many similar series’ introductions, the pace is relentless and focuses far more on action and personality than the necessary underpinnings of an extensive setup. What never wavers in Exiles #1 is the visual storytelling. Even when a page teeters under the weight of exposition, the images constructed beneath them bear that weight with ease. The most mundane layouts still offer ample depth and shift perspectives to make every new panel engaging. Character designs are rife with new details and make it possible to study something as simple as Blink’s new hairdo for minutes. The same applies to backgrounds and a variety of other elements. It’s clear even from a glance that Rodríguez has carefully considered each page and every panel when constructing this issue. The fourth page of the issue is a true stand-out moment and a case study in why any fan of superhero comics ought to be following Rodríguez’s work at this moment. He constructs an image of Blink in a montage of photographs. Together they create a central form, but also allude to historical connections and different periods of the character’s design. It is an encyclopedic description of this series’ heroine in purely visual terms. That sort of design is present throughout the issue. It’s rare that more than a few pages go by without spiraling panels or some other element transforming the layout itself into a key component of the story. 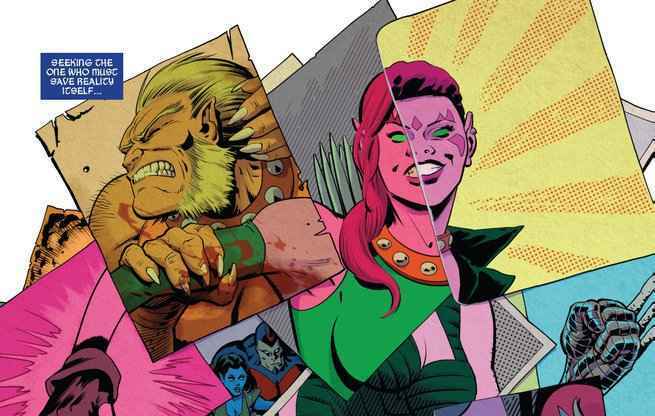 As universes collide and the Exiles continue their adventures, these sorts of experiments and creations are likely to only become more prevalent. Exiles is a great concept, but it’s only as good as its execution. This debut should reassure existing fans and promise new ones that the team is in the very best of hands. Based purely on the work of Rodríguez, López, and Bellaire, there is an argument to be made that this is a must-read at Marvel. The most standard pages they deliver exceed the best of many other ongoing series. Yet the groundwork is also being laid for a reality-hopping adventure every bit as good as those in the original from 20 years ago. Ahmed has made quick work of the explanations and rigamarole of setup, and is now fully prepared to embark on an adventure with compelling characters and a deeply disturbing foe. This is how you introduce a new superhero team; long live the Exiles.